If you’re brand-new to customer service with Salesforce, start with Service Cloud for Lightning Experience. You’ll learn about the latest features to wow your customers and service team. This module is for Trailblazers already up and running with Salesforce Classic and covers similar things. Describe what Service Cloud is and how to use it. Collaborate on cases and understand case feed. View and create cases, and add attachments to a case. Plan for a knowledge base strategy. Service Cloud is a customer service and support application. It helps keep your customers happy and your support team sane, whether your customers reach out to you by email, phone, social media, online communities, or real-time Web chat. These different ways of reaching out are called channels, and they help you help your customers through their preferred communication tool. Giving your customers a choice in how they communicate with your company is the first step towards delivering extraordinary service. The second step to delivering extraordinary service is making sure that your support team can work comfortably with multiple channels simultaneously. The last thing you want to do is burn out your support agents with a complicated app—frustrated support agents don’t provide first-rate service. 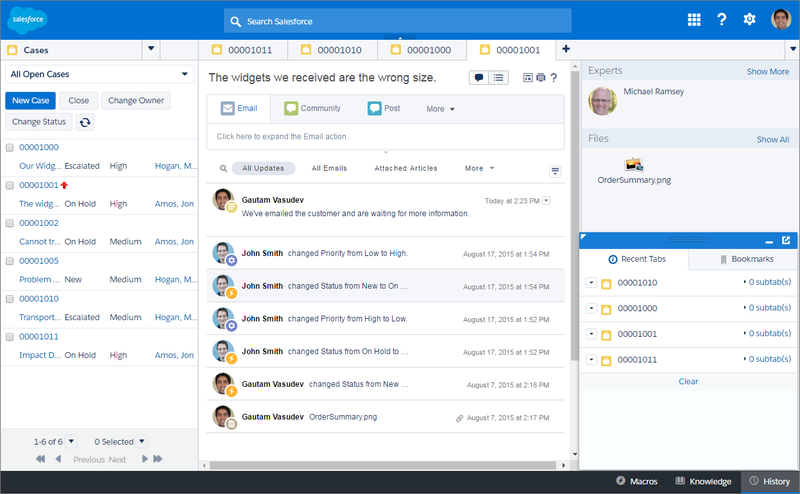 That’s why Service Cloud integrates multiple channels into an easy to use help desk called the console, which you can customize to fit your company’s unique support processes. Another way to make life easier for your support agents and customers is to turbocharge your support processes so that they happen like magic. The Service Cloud helps you do just that. With the click of a few buttons, you can choose when customers receive responses, when support tickets should escalate, and when service agents should be assigned to specific tasks or customers. You can also capture your support team’s expertise and knowledge in what’s called a knowledge base so that customers can receive service faster or even solve their own problems themselves. Of course, before you can have all this magic at your fingertips, you need to have a few special Salesforce licenses. Most of the licenses below are already included in Developer Edition so that you can test out the Service Cloud there instead of your company’s Salesforce organization. Lets support agents use the console for service. Lets support agents create and edit knowledge base articles. Lets support agents communicate with customers using Web chat. Lets support agents communicate with customers on an online community. Your customers need your help. Complaints, problems, comments, and questions are normal, but when your customers have issues with your product or service, your company risks losing customers or damaging your brand. The best way to prevent that from happening is to track your customers’ issues and resolve them quickly. That’s where cases come in. Cases are powerful records in Salesforce that not only track customer issues, but also show a 360-degree view of the customer. All unifying information about a customer is stored on a case—account, contact, history, products...whether the case has an email exchange, a reminder task, or a knowledge base article, it’s all saved on the case so that any support agent can jump in to help a customer at any time. Cases can range from a low priority of, “A sentence on your website is missing a period,” to a higher priority of, “How do I return my $50 million dollar shipment of diamonds?” It doesn’t matter if your support team receives a customer issue by email, Web chat, or any other channel: all issues are tracked as cases. 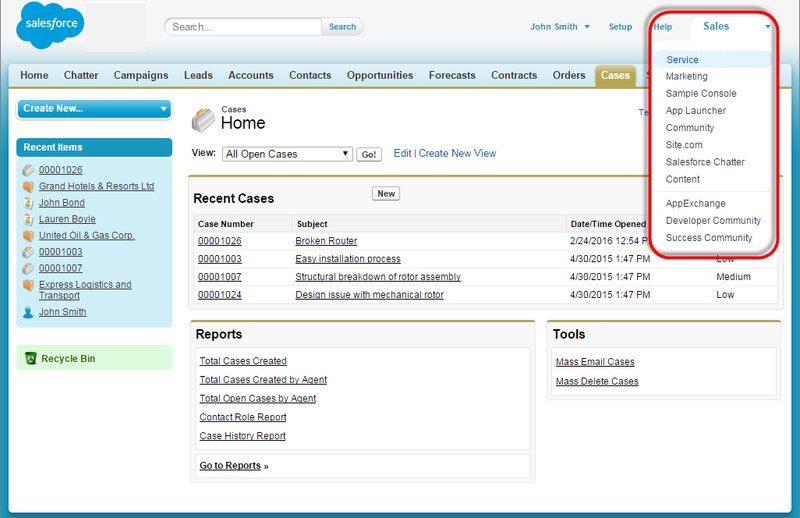 Just like other records in Salesforce, you can customize cases to fit your business. 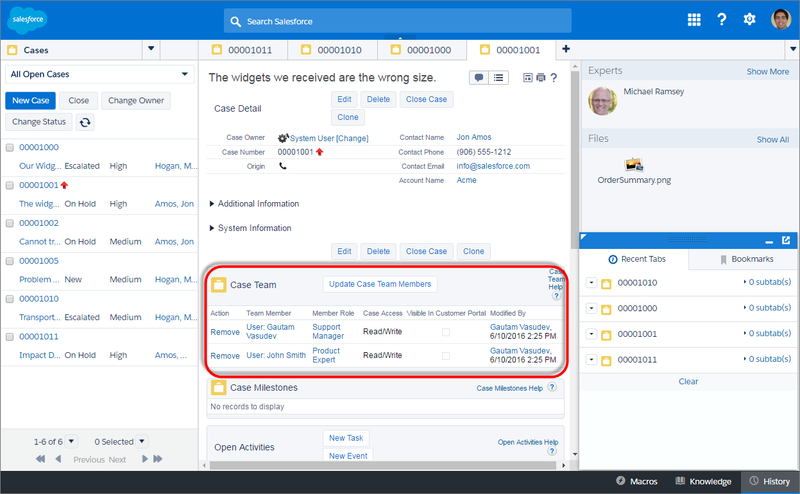 Add unique case fields, edit page layouts to change how cases appear, and define case record types to require specific information for particular service process. Typically, cases are related to accounts and contacts so that support teams can easily see all the information related to a customer. But since resolving a customer issue–also known as “closing” a case–might require input from many people across your company, cases have some awesome collaboration capabilities. First, there’s case feed. Case feed helps everyone on your support team easily collaborate on closing a case quickly. In the feed, every action is tracked for a complete view of the customer’s issue and its history. Second, there are case teams. Case teams let you predefine groups of people and their roles on closing a case together. A case team could include a support agent, a product manager, a lawyer, a clown, you name it! You can also define each team member’s level of access to a case, such as read only or read/write. As the number of your company’s cases increases, your support team needs a simple way to manage them all. That’s why the Service Cloud includes several behind the scenes features to automatically trigger actions and workflows, and push cases to the right people and places without overwhelming anybody. Case management is routing cases through your custom processes with as little work as possible while wowing your customers with superior service. We’ll explore those powerful features later in the module on automating case management, but for now, let’s check out a case. Let’s see how easy it is to view and update a case. The sample Service Cloud that Salesforce gives you looks a bit different than what you saw above. That’s because we wanted to show you how awesome the Service Cloud can look after you customize it. Once you get to know the Service Cloud, you can customize it to look more like what you saw in the introduction. You’ll want to have a practice environment as we walk through making some basic changes in Salesforce. If you have a Trailhead account, you already have a hands-on org for practicing skills and checking Trailhead challenges. Open it now by clicking Launch in the challenge at the end of this unit (login required). Once you've launched your Trailhead Playground, switch to Salesforce Classic. Click the Cases tab. If you don’t see the tab, select Service from the App menu. The Service app displays many Service Cloud features and is optimized for users that handle a high volume of questions. Just like other records, you can select different list views. You can also click New to create a case. Here’s what a case looks like. Check out the case feed publishers, which you can click to do different things. If you want to see case details without the feed, click Details. Click File to attach a file from your computer to the case, and click Share to update the case. Click Post to type a case comment, for example, I wowed this customer, and click Share to update the case. Now anyone on your team can see how and when you’ve updated the case. Delivering an amazing customer experience requires the work of an amazing service team. Sometimes a single agent can solve a case in a single transaction, and “first call resolution” is a metric many service organizations track and aim for. But some cases require input from a bunch of people who need to work together to answer the customer’s question and close the case. For these scenarios, you can take advantage of Case Teams functionality to involve employees across your company in the resolution of the case. With case teams, you can add customer support roles and choose the people for the teams. First, we’ll create roles, then we’ll define the teams to add to cases. 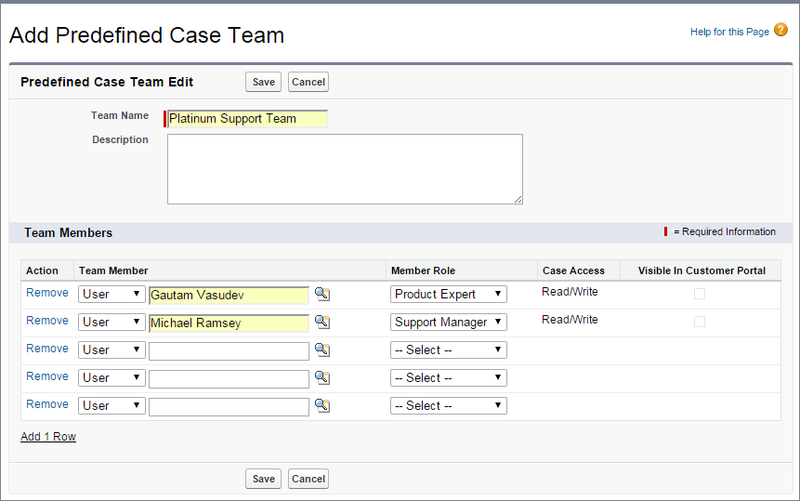 From Setup, enter Case Team Roles in the Quick Find box, then select Case Team Roles. Type a role, for example, Support Manager, and choose Read/Write access to cases. You can create many roles and choose their levels of access. If your company set up an online community, you could click Visible in Customer Portal so that your customers see the teams on their cases. In the future, we’ll explore communities in another module. To create more roles, repeat the steps above or click Clone and update the role with a new name and level of case access. 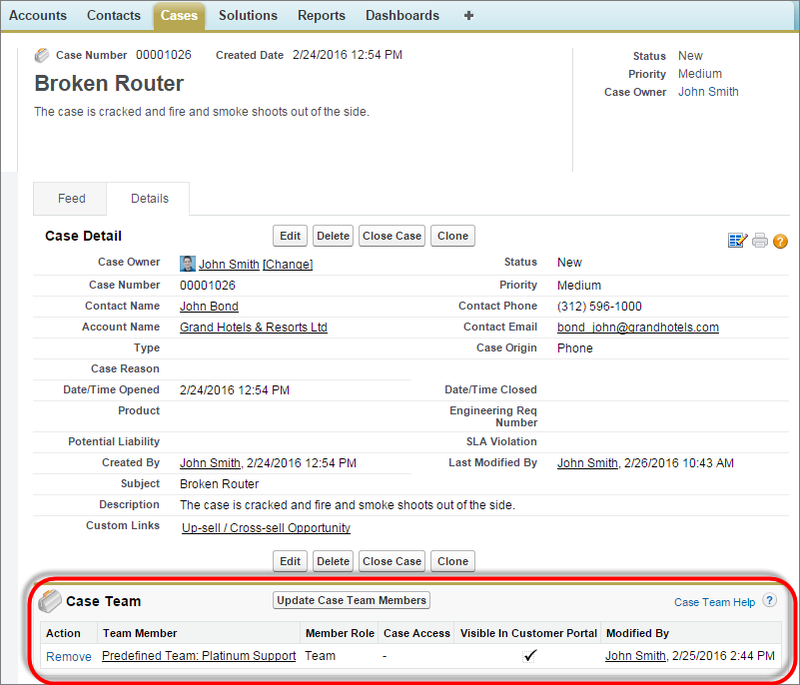 From Setup, enter Predefined Case Teams in the Quick Find box, then select Predefined Case Teams. Type a name for the team, for example, Platinum Support Team, and select users and their roles. Now let’s add the Case Team related list to case page layouts so that your support agents can see the teams on cases. From Setup, click Customize | Cases | Page Layouts. Next to Case Layout, click Edit. From Related Lists, drag Case Team under Related lists and click Save. Go to a case and click Details. 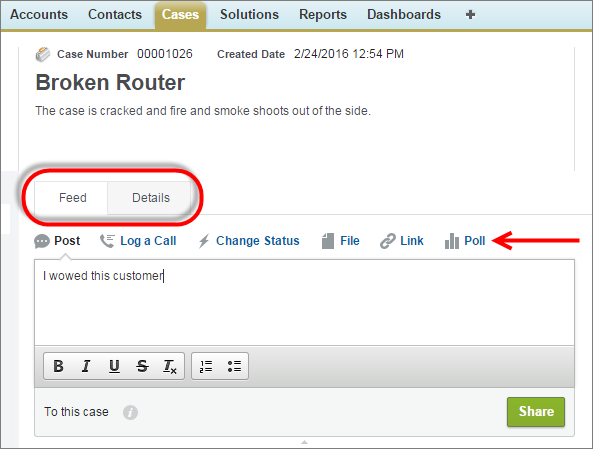 Case Team is on the case, and you can click Update Case Team Members to add your predefined team. Get ready to help your customer. If you’re familiar with workflow, you can add alerts that automatically email case team members when a case changes. For example, if a case’s Priority is changed to High, a manager is notified. To learn more about workflow, check out the Process Automation module. 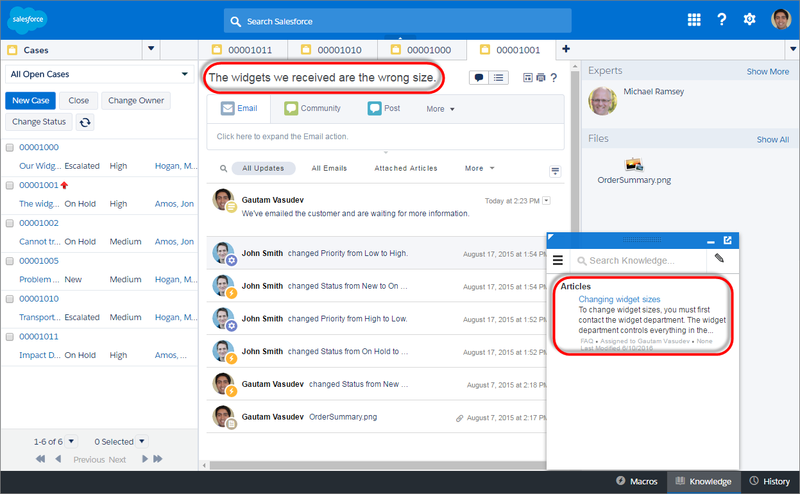 Knowledge articles in Salesforce are where you store answers to commonly asked questions, useful FAQs, and information that helps agents help customers and ultimately close cases. Salesforce Knowledge is powerful and feature-rich, so it’s more than we'll want to cover in this specific module. But it’s important that you understand some of the basics so you can start thinking about your strategy while you’re planning your overall support processes. Consider what types of information your agents can create, share, reuse, and update to solve cases quickly. Rest assured, we’ll cover Salesforce Knowledge in greater detail in a later module, but one of its key benefits is that it automatically suggests useful information to agents based on each case’s details. As agents solve cases, they can create articles to help the next customer or agent with similar issues find solutions faster. Articles that help solve a case are attached to that case. When cases with comparable titles are opened, articles attached to similar cases are brought to the forefront. Do you want your agents to update the knowledge base directly? Do you want to approve articles before they’re published? Who should see articles? Employees, customers, or both? What are your requirements around maintaining past versions of articles? Do you need different page layouts of articles based on the article type? How do you want to categorize your articles? Do you require multi-language support? Is your head spinning yet? Don’t worry, that’s why we’re only touching on the topic briefly. For guidelines, resources, and current discussions on the evolving world of service innovation, check out the Knowledge-Centered Support (KCS) initiative. One of the key benefits of KCS is that agents can update knowledge on the fly so that support information is always relevant.